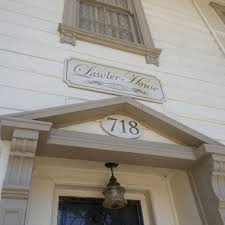 It was estimated from Lawler oral family history that the house was built in 1857, although my current research may have to revise that date to a few years later. The ownership of the house in the original report indicated unknown ownership from the 1850s to 1919 when the Vest family bought the ranch. In 1932 they sold to the Field family who owned it until they sold to the Brownells in 1932. The Lawlers purchased the ranch in 1947 and held it until 1976 when they sold the 2,000 acre property and house to the Ken Hoffman Company. Finally, in June 1979, the house was inched along to the barge. Anxious moments were experienced as the 160,000-pound structure tilted precariously as it was loaded onto the craft. At last it was on the barge and on its way. PAST members, including local historian Mary Higham, had been recording the entire process of saving the house. When the move began they followed the house all the way, taking photos as it rumbled toward its final resting place. Breathing a sigh of relief, everyone was finally able to relax as the home settled onto its new foundation, success was at hand. SUISUN CITY — The spirit known as Victoria was apparently drawn to the Lawler House’s front porch by the metal sculpture of the jester whose legs were bent as if he was dancing. “She identifies with this because her own legs were twisted up by polio,” said paranormal investigator Devin Sisk who, with his group of fellow paranormal investigators, has spent the past several months researching old town Suisun City’s supernatural past. Victoria, Sisk said, died in 1923 when she was 7 and had a brother who also died young. Sisk first encountered her across Main Street, but said he noticed she was more often found at the Lawler House. Next the two other well-known and identified spirits that frequent the house were Identified. One Mr. Beck And Robert Waterman. Dave's taped interview of the Woman who manages the house turned up with several areas where the audio is interrupted with clicks and pops with a reduction of the volume, especially over the explanation of the spirit interactions she was describing. It was determined that because the phone operates normally in all other instances such as in calling and audio (music) that there was not a problem with is hardware. This is all that turned up on microphone problems for the Galaxy S3. I checked on some forums and found that the only problem with the microphones was the 'noise reduction feature' in the software of the phone, not the physical phone its self. Microphones do not make noises like that unless there is a short. Since Dave's phone work just fine we can assume it was not from a short. There was some speculation that the phone may have been interfered with electromagnetically. All life forms and coherent energy (Ghosts spirits ED's) all have an electromagnetic field. Human beings have a field. Within certain ranges exposure to these fields is not detrimental, in others it can cause an entire array of symptoms. There is quite a lot of debate on this subject but after you scan the above reference it is obvious there may be purposeful confusion of this subject. There is also quite a lot of research on hypersensitivity to EMFs. EHS is characterized by a variety of non-specific symptoms, which afflicted individuals attribute to exposure to EMF. The symptoms most commonly experienced include dermatological symptoms (redness, tingling, and burning sensations) as well as neurasthenic and vegetative symptoms (fatigue, tiredness, concentration difficulties, dizziness, nausea, heart palpitation, and digestive disturbances). The collection of symptoms is not part of any recognized syndrome. Dave would like to acquire a few more tools and gadgets for the next expedition. Many ghost-hunting groups say they find evidence of something they can't explain through scientific or natural means, yet critics question ghost-hunting's methodology, particularly its use of instrumentation, as there is no scientifically proven link between the existence of ghosts and cold spots or electromagnetic fields. According to skeptical investigator Joe Nickell, the typical ghost hunter is practicing pseudoscience. Nickell says that ghost hunters often arm themselves with EMF meters, thermometers that can identify cold spots, and wireless microphones that eliminate background noise, pointing out the equipment being used to try to detect ghosts is not designed for the job. "The least likely explanation for any given reading is it is a ghost," maintains Nickell. Orbs of light that show up on photos, he says, are often particles of dust or moisture. "Voices" picked up by tape recorders can be radio signals or noise from the recorder and EMF detectors can be set off by faulty wiring or microwave towers. Spirit Boxes are quite popular for this type of investigation. They can be expensive or not depending on brand names and you can make your own. The better one scan AM and FM radio at a rate of about 60 channels per second. So when they work and you get a voice that has multiple syllables in the same voice, you definitely have a spirit connection. The do-it-your-self models can run about $200. Similar to spirit boxes are the EVP generators. Rick made one of those with down loadable software from Windows called EVP Maker and an old lap top computer. He stated this is NOT audio pareidolia That this program works off a library of phonetic sounds and can be so accurate that it can produce inflections - sighs, pauses and the like. Analogue has always been the best to capture sound and photo proof because it cannot be manipulated very easily. The magnetic hiss of the tape help the spirit to form words out of the hiss. On emulsion film, it is very difficult to manipulate or fake thing. 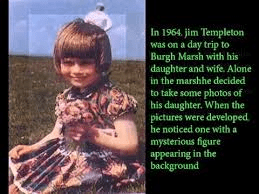 For instance we have the Solway Firth Space Man, who looks very similar to the flying man seen in Los Angeles. Join us on the You Tube channel for the rest of the evening's insightful conversation into Beyond the Strange.